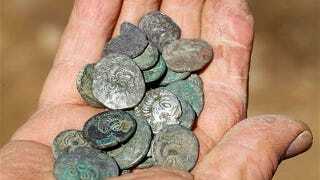 Great news for all you hopeful amateur metal detectorists: Two men, who'd been searching the same field for nearly 30 years, have stumbled upon the largest hoard of Iron Age coins ever discovered in northern Europe. Inspired by legends that a local farmer once discovered silver coins on his land, the men unearthed the congealed chunk of 50,000 silver and gold coins after following a trail of pieces — that turned out not to be related to the cache. Reg Mead and Richard Miles found the clump inside a massive block of soil in a field in Jersey, U.K., and it's thought that the coins were from Armorica, modern Brittany, and Normandy. The coins, which are in surprisingly good condition, are thought to have been buried at a time when Caesar was campaigning through Gaul. The owner likely buried the coins in an effort to hide them — never to be seen again, until now. Most of the Jersey coins are still locked inside the soil block, which weighs three quarters of a ton and has been removed in one piece from the ground and taken to a safe place. Excavation continues in the field to make sure the whole story has been revealed. The exact location has not been disclosed, and the island's environment minister, Rob Duhamel, said it would get official protection to keep it safe from looters. "It is a very exciting piece of news and perhaps harks back to our cultural heritage in terms of finance. It was found under a hedge so perhaps this is an early example of hedge fund trading." De Jersey said the find was exceptional, "certainly the largest hoard of Iron Age coins ever found, not just in Jersey but the whole of the Celtic coin-using world … it is difficult to come out with a figure much below 50,000 coins given the volume of the block." He believes there may also be Iron Age jewellery in the soil block, as in other Jersey hoards. The coins, which are estimated to be worth about £10m ($15.8m), may go on display in the island's main museum should the land owners get their way. But exactly who owns the coins will likely take months to determine. Hmmm, so much for finder's keepers. Top image via Telegraph; inset image via Culture 24. All images courtesy Jersey Heritage.